An older professor showing younger female student liquid filled glass beaker in chemical laboratory. 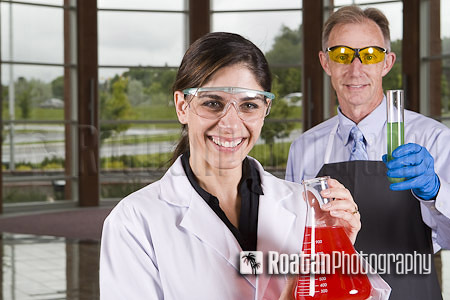 Both teacher and student are dressed in protective lab safety equipment, and are looking at camera smiling. This image and many more can be licensed as stock photos here. Roatan Photography also provides customized commercial photography to suit your advertising photographic needs.